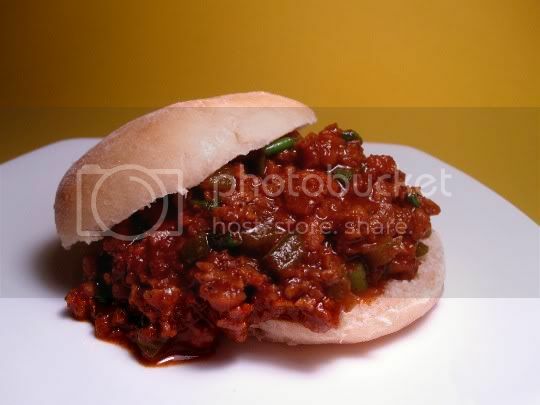 Sweet, savory, tangy, salty, and spicy...who DOESN'T like sloppy joes? This veganized version of the classic comfort food is absolutely AMAZING. Seriously, the aroma is simply mouthwatering, and it's got a sneaky heat that really kicks up your taste buds. And hey, there's even beer cooked in it...what more can you ask for?! In only about 30 minutes, you'll have this filling and ultra addictive meal ready for quite a few sandwiches. Simply add a couple packages of soy grounds (I used the Yves brand) to sauteed garlic and bell peppers, plus jalapenos, chili powder, beer, chili sauce, and soy sauce. Simmer, add in chopped green onions at the end, and serve! You won't even need any extra seasoning at the end, this stuff is perfect as is. Tomato-based, with a fresh jalapeno heat and slight bitterness from the beer. The mixture is almost chili-like: in fact, I'd say you could add a couple cans of beans and end up with a huge delicious pot of chili. Or, add the filling to tacos, quesadillas, burritos, nachos...you get the idea. These joes lasted me for a full week, and they seemed to get better by the day. Seconds (or thirds) please! Make again? Helllll yeah! I'd love serving this to my meat-eating friends.